This exercise is intended to loosen the plantar fascia (The tissue on the bottom of the foot). It can relieve foot soreness and pain, and it can even release the hamstrings! To do this exercise you will need a spiky ball. Place the ball on the floor, and place your foot on the ball, and begin rolling your foot back and forth on the ball. 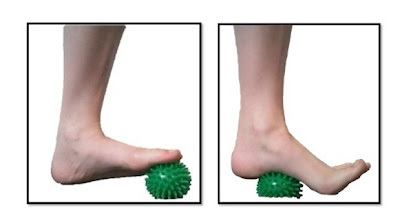 This is a great way to release the soft tissue on the bottom of your foot. It can increase flexibility and improve dexterity and strength in the foot. It feels great and can help maintain the pliable healthy feet we all want.